A rock that is sculpted into a bent sun on the waterfront of Lake Champlain. 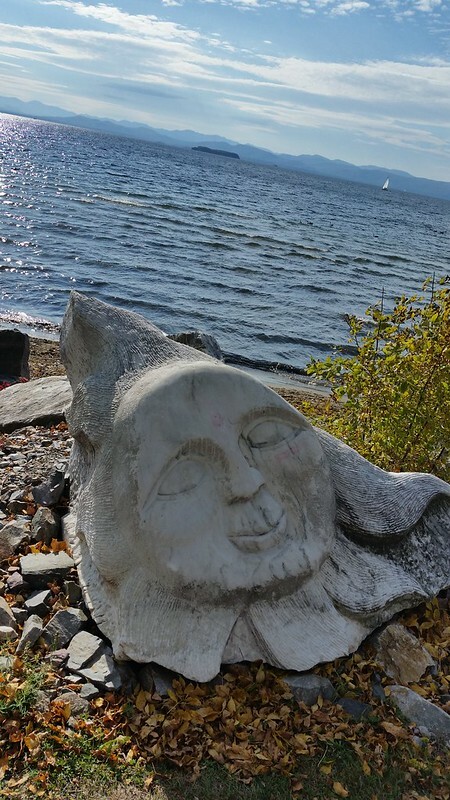 Along the bike path at Lake Champlain in Burlington, there are some interesting sites including some creative rock sculptures. One cannot tell if they were rocks that had been chiseled into sculptures or blocks of rock chiseled down into rock-appearing sculptures. This one in particular was creative because you approach it and think it is a moon but as you approach it and look more closely, it's a sun that's almost bleeding onto the rock. It's both eerie and rather intriguing to look at.